Watching the 500-pound green sea turtle swim around her tank is Anjali Bhardwaj’s earliest memory of her family’s frequent visits to the New England Aquarium in Boston. That was when Anjali started to fall in love with the ocean. And when she graduates from Jacksonville University this spring with a bachelor’s degree in marine science, she plans to make it her life’s work. Completing her education, however, has been a challenge for the 22-year-old because as much as she loves her studies at JU, Anjali has wanted most to be at home in Reading, Mass., with her family. The summer after Anjali’s freshman year in college, her mother, Mary, 61, was diagnosed with glioblastoma, an aggressive form of brain cancer. 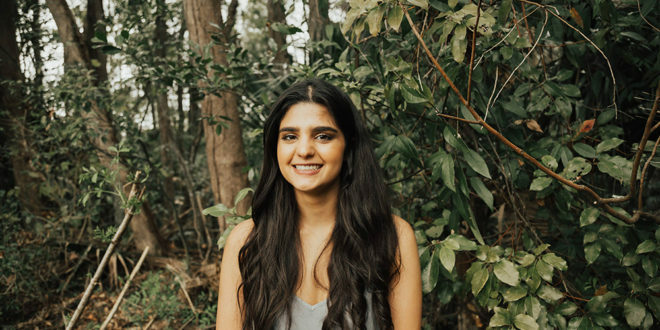 Anjali took off that fall semester so she could help while her mother underwent treatment, including driving to Massachusetts General Hospital in Boston for radiation treatments every day for six weeks. Anjali seriously considered transferring to a school closer to home, but her mother would have none of it. After all, her mother was the one who had discovered JU’s Marine Science Research Institute and knew it was the perfect fit for Anjali. At Mary’s insistence, Anjali came back to Jacksonville and back to the degree program she loves. But she spends every summer at home taking care of her mom. It’s a close relationship. Mother and daughter chat every day by phone. A senior this year, Anjali was determined to graduate on time, despite the setbacks of her mother’s devastating illness and missing an entire semester. But earning a science degree in only seven semesters has been especially difficult, particularly since much of her coursework includes lab requirements. She has been completing four labs a semester, a grueling schedule, all while working as a teaching assistant and receptionist in the Honors Undergraduate Research Office. Dr. Janet Haavisto, director of Honors and Undergraduate Research, said Anjali is always upbeat and ready to help. “She has quite an artistic streak. We decorate the lounge for holidays and parties—she makes a lot of the decorations,” Haavisto said. Anjali’s supervisor, Linda Christoffersen, honors coordinator, has been equally supportive, asking how Anjali and her mom are doing. “She’s a beautiful girl, inside and out,” Christoffersen said. And Dr. Quinton White, executive director of the Marine Science Research Institute, was always a phone call away. In addition to a rigorous schedule and her part-time job, she has served as a teaching assistant to a freshman oceanography class. She also really enjoyed her two internship opportunities through the Marine Science Research Institute. At the Jacksonville Zoo and Gardens she worked with stingrays, helping train the skittish creatures and assist with various medical procedures, including ultra sounds. At the New England Aquarium, she worked with seals and sea lions, and became especially fond of northern fur seals, a protected species found in Alaska and Russia. Anjali plans to work for a few years after graduation — at the aquarium or possibly the Woods Hole Oceanographic Institution on Cape Cod — and then attend graduate school. She wants to raise awareness about the importance of protecting the ocean and understanding how humans affect it. She also wants to stay active in the National Brain Tumor Society, an organization where she and her family have found a lot of support. Anjali said brain tumor research and treatment, for both adults and children, needs more funding. In the spring of 2015, she was part of a delegation that lobbied members of Congress for that funding. Last summer, she witnessed the signing of a proclamation declaring the month of May Brain Tumor Awareness Month in Massachusetts. The life expectancy for a patient with glioblastoma is 14 months, Anjali said. But her mother is still making those daily calls to Anjali more than two years after her diagnosis. “She is really strong and is always so positive, but she can’t handle everything,” Anjali said. “She has dealt with seizures, strokes, a brain hemorrhage, memory loss and losing the ability to walk, but has always been more concerned with everyone else being OK,” Anjali said. “Because of this—all of this—having her at my graduation has been the ultimate goal. Anjali said she would love to take her mother to the beach while the family is in Jacksonville for Commencement, so they could enjoy the ocean side-by-side, perhaps for the last time, a tie that will always bind them.